Kim Jong Un took to the skies in his remodeled Cold War era IL-62M to see a high-rise construction site located along the the Taedong River in Pyongyang. One of the North Korean Air Force's two known IL-62Ms appeared last year after having received new paint, although the mechanical reliability of the old jet has been suspect. You would think to see a local construction project from the air, the 'Young Master' would have gone by executive helicopter, although there really has never been any photos of him utilizing choppers to move around the country. 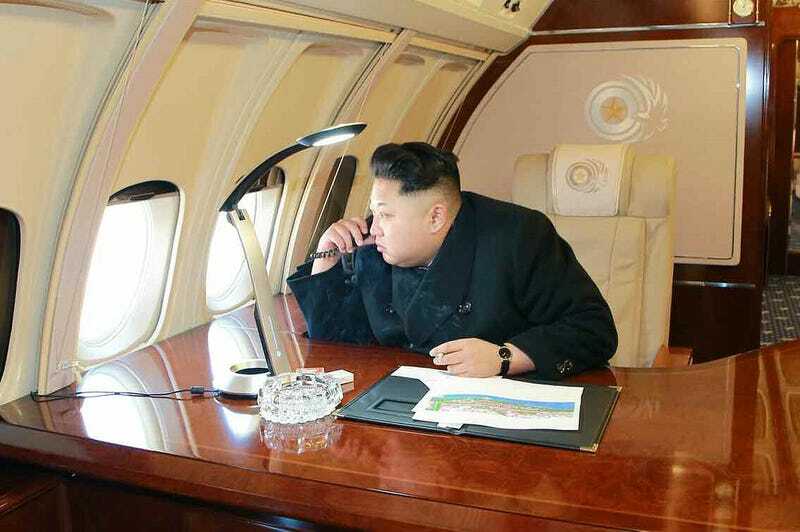 North Korea's 'Air Force One's' interior looks like it has had a total overhaul recently, with new full cabin fascia treatment, plush over-sized seating updated and wood accouterments added. As you can see in this rare screencap, the state's IL-62M's interior used to look like a 1980s nightmare. He, to begin with, commanded a bird's-eye view of the construction site from his plane. In the plane he said that it was very nice to see buildings under construction as required by the lay-out design of the street ratified by the party. He expressed great satisfaction, saying that the frames of the apartment houses and public buildings to be completed in the first phase have sprung up like mushrooms after rain thanks to the devoted struggle of soldier builders. The construction site of the street is reminiscent of those in the 1970s and the 1980s and Pyongyang spirit and speed today are being created there, he added. Noting that the objects built in the first phase will look splendid when those in the second phase are constructed well, he fixed the construction projects in the second phase and their scale. Looking down the magnificent appearance of Pyongyang City changing day by day from the plane, he said he came to have the conviction that if the construction makes progress at this speed, it is possible to successfully face-lift Pyongyang, the capital of the revolution, as a world class city to be envied by the world true to the behests of the great leaders in the near future. After Kim Jong Un and crew did a flyover of the construction project, they visited the same site on terra firma. Mirae Scientists Street is touted as a symbol of the Party's dedication to science and progress. It is a massive live-work development area with thousands of housing units per building and is said to be a key element of Pyonang's 'face-lift.' Apparently, it is also going to be very 'colorful' in an early 1990s art-deco kind of way. North Korean state media says that their leader 'unconditionally' calls for the first phase of construction on the project to be finished by 'Day of the Sun,' which is April 15th of this year, and the second phase finished by the 70th anniversary of the Party. State Media also said the development project showcases the 'level of the Korean people's civilization and mental power of the army and people,' and praised the 'soldier builders' for working so hard on it. Pro tip to the 'soldier builders,' I think you probably want to get it done by those deadlines! He gave instructions to produce furniture and fixtures for flats at the highest level while building the street and construct well medical care and commercial network and cultural facilities including barber's shop, beauty salon, laundry, bath house, dress and shoes repairers, pharmacy, restaurant, shop and library... He told the commanding officers to give precedence to the frontline-style political work for giving fullest play to the mental power of the soldier builders, dynamically conduct a socialist emulation, pay deep attention to the supply service for them and take care of them like their real parents would do so that they may not have any slightest inconvenience in their living.